Heartless resembling a jellyfish. You receive damage just from colliding with it. They move slow, but break up into many Sea Neons if struck. They fling their tentacles away to keep their enemies away. The Sheltering Zone is an Emblem Heartless that appears in Kingdom Hearts. It is a large Sea Neon, and will split into three Sea Neons if defeated without magic or a critical hit. Sheltering Zones, like their smaller counterparts, are based on jellyfish. 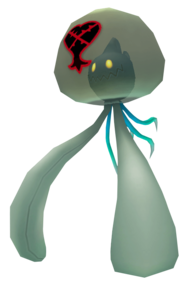 While they have a number of small bluish-green tentacles dangling beneath them, much like are found on real-life jellyfish, they also have two massive pale blue tentacles in the front that allow them to bash Sora and his party for big damage. 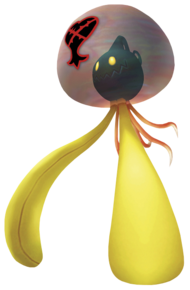 They also boast light grayish-blue transparent heads; hidden behind the prominent Heartless emblem there are their sinister Heartless visages, complete with a crooked, toothy smile, bright yellow eyes, and a medium-length plume that ends in a spiral. Kingdom Hearts Final Mix Sheltering Zones mirror the warmer colors of the palette swapped Sea Neons. They have orange small tentacles, bright yellow big ones, and a reddish-black iridescent head. The Sheltering Zone's name may be referencing its ability to split into three Sea Neons when it is defeated; as if it was "sheltering" them from the battle. A Sheltering Zone, very much like an Aquatank, is docile in battle unless disturbed. Sheltering Zones attack by swiping their tentacles at Sora and his party. They are also the only enemy that Sora takes damage from just touching it. If a Sheltering Zone is destroyed by a weapon as opposed to magic, it will split into three Sea Neons. This page was last edited on 3 May 2018, at 21:19.